Show off your ISML-related talents, whatever they may be. You can also request character avatar changes here. Must have the phrase "International Saimoe League 2017" on it. 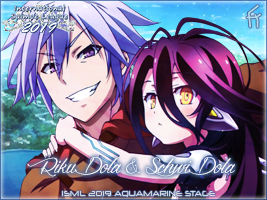 Must have the official ISML logo. Do not show a character's eyes, if any are present. Keep these relatively abstract, neutral, and anonymous. Using pretty backgrounds is encouraged. No prominent quotes. A design with random words and phrases as part of the background should be fine. Keep all text and logos at least 10px away from each corner. The corners will be rounded off when displayed on the website. The fonts used in the PSD are "Segoe Print" and "Brush Script Std." You may submit an unlimited number of times. Deadline is April 1st, 2017! Credit to Momento10 for this mini-banner! Dealing with new work: edit original post or make a new post? IGNITE wrote: Dealing with new work: edit original post or make a new post? Thanks for your hard work so far! I would say if no one has posted after you, then you can feel free to edit your post since I won't accidentally skip over it if your post is the latest one. Hope this helps! After all, to me the most important thing is that you're truthful - claire. Thanks for all your submissions so far guys! I haven't had a chance to touch Photoshop in a long time myself, so I took a little break studying to work on a couple banners. I love seeing everyone's work so far! This is not a bad start so far! Some things I would recommend is choosing an image that can fill up the dimensions without having to resize it. You can sorta tell that it looks a bit stretched, which can decrease the quality a lot. Another thing is choosing a font and font color that can go hand in hand with the overall theme of your poster, so you would want to adjust the color of the logo and your text color to make it fit better with whatever you're editing. Does that sorta make sense? I hope it can help a bit in the future! Last edited by Kiwigiwi on Sun Jan 29, 2017 11:02 am, edited 1 time in total.